For a great family camping vacation, head to Gordon Bay Provincial Park, located on the shores of Lake Cowichan, north of Duncan on Vancouver Island. In the summer the lake is warm and the sandy beach makes for great family swimming. History buffs find plenty to interest them in the park and the surrounding area, which is home to a second-growth Douglas-fir forest. Set in one of Vancouver Island’s sunniest valleys, this area boasts the highest average annual temperature in Canada. The lake is known for its spectacular freshwater fishing in the spring, fall and winter, when anglers can be challenged by rainbow, cutthroat and Dolly Varden trout. Waterskiing and windsurfing are also popular activities on the lake. This small wilderness area features a number of walking and hiking trails with unparalleled views. Keen-eyed hikers can spot a variety of wildlife and birds, including juncos, Stellar’s jays, chestnut-backed chickadees, mergansers and golden eye ducks. Visit in April when the wildflowers are at their peak. A fascinating little museum with history about the area is located at Saywell Park. Teleglobe Canada presents guided tours of the Lake Cowichan Earth Satellite station. The forest industry has a number of displays and demonstration forests throughout the area. Gordon Bay Provincial Park is located 35 km northwest of Duncan on southern Vancouver Island. The park, situated on the shores of Cowichan Lake, is accessed via Hwy #18 off Hwy #1. Travel 26 km west on Hwy #18 to Lake Cowichan, then 14 km on South Shore Road. Nearby communities include: Honeymoon Bay, Cowichan Lake, Youbou, Duncan, Victoria. History: The area is rich in the logging history of the Cowichan Valley, and a number of displays and demonstration forests are located near the park. 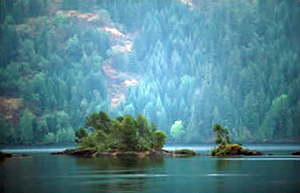 The forest was one of the first on the island to be logged, probably because of the relative ease with which the felled trees could be skidded to the lake and floated to the mills. The notched stumps supported springboards that allowed old-time loggers to stand above the dense shrubbery so they could cut down the massive trees that dominated the area. Conservation: The forest floor is covered with the same kind of shrubs that made such hard work for the fallers: thimbleberry, salal and salmonberry. You can also see vanilla leaf, foamflower and bunchberry which grow closer to the ground. Dolly Varden, Rainbow and Cutthroat trout live in the lake and chum, coho and Chinook salmon spawn in the lake and its tributaries. Steelhead spawn in the Cowichan River. Rare rocky mountain juniper adds to the uniqueness of the area. Adjacent to Gordon Bay Provincial Park is Honeymoon Bay Ecological Reserve, which protects a variety of rare and endangered plant species. Wildlife: As you walk through the forest, look for deer, raccoons and red squirrels. Birdwatchers often see juncos, Stellar’s jays and chestnut-backed chickadees, as well as mergansers and golden eye ducks. Black bears, Roosevelt elk, black-tail deer, beaver, raccoons and cougars can all be spotted in the park. Canoeing and kayaking can be enjoyed on Cowichan Lake. A boat launch is located northeast of the day-use parking lot. Cowichan Lake is known for its spectacular fresh-water fishing in the spring, fall and winter, when anglers can be challenged by rainbow, cutthroat and Dolly Varden trout. Gordon Bay has a number of short, in-park trails that lead to the lake. For your own safety and the preservation of the park, obey posted signs and keep to designated trails. Shortcutting trails destroys plant life and soil structure. Pets/domestic animals must be on a leash and under control at all times and are not allowed in beach areas or park buildings. You are responsible for their behaviour and must dispose of their excrement. Backcountry areas are not suitable for dogs or other pets due to wildlife issues and the potential for problems with bears. Opportunities for fresh water diving exist in the lake. Cowichan Lake provides excellent swimming and water-oriented activities. The water is warm in the summer and the sandy beach has a designated swimming area, identified by a log boom. Access to the swimming beach is via the day-use area. Waterskiing is a popular activity on Cowichan Lake. A boat launch is located near the parking lot. Waterskiers must remain outside of the log boom. Windsurfing is a popular activity on Cowichan Lake. A boat launch is located near the parking lot. Windsurfers must remain outside of the log boom. A boat launch is located northeast of the day-use parking lot. Campfire rings are provided at each campsite. Fire bans may be implemented during extremely hot weather conditions. Be prepared to bring a portable stove for cooking. Firewood can be purchased from the Park Operator. Fees for firewood are set locally and may vary. To preserve vegetation and ground cover, please don’t gather firewood from the area around your campsite or elsewhere in the park (this is a ticketable offence under the Park Act). Dead wood is an important habitat element for many plants and animals and it adds organic matter to the soil. This park has a large day-use/picnic area with picnic tables, parking lot, adventure playground, amphitheatre and flush toilets. The day-use area is a popular spot for local residents, who come to the park to swim and picnic. Pit toilets are located throughout the park. Flush toilets are located in the campground and day-use area and are open from March 30 to October 31. There is an adventure playground available at the day-use area of this park. There are two separate hot shower facilities in this park, located within the campground. This park offers vehicle accessible, semi private campsites, set in a second-growth Douglas fir stand. Campsite reservations are accepted and first-come, first-served sites may also be available. A number of facilities at this park are wheelchair accessible, including picnic tables, the main campsites and group campsite, and the shower and flush toilet buildings. The park is open year-round with limited services in the off-season.